NOTE: This is for Salsa Classic. Click here to review Salsa Engage Peer-to-Peer Campaigns. Peer to Peer Campaigns in Salsa create a page where your supporters can come to create their own donation pages to send to friends and be included in a main search on your website. The donation page will be branded with your template, but can be personalized by your donors. This slideshow provides an overview of the process to create a P2P Campaign and Personal Donation Page. For detailed instructions, see the feature documentation below. Create a P2P campaign - Create a new campaign (a P2P Campaign is a page from which your supporters may create their own fundraising pages). After clicking this link, you'll be presented with a Salsa workflow as described below. Edit a P2P campaign - Edit a previously created campaign. After clicking this link, you'll be presented with a list of campaigns. Find the one your want and click the text link that says Edit (in the first column). Fundraising Campaign Name: This field creates the "headline" in large text at the top of the P2P page the supporter will see (and share). Typically, this would be used to describe the page's contents give a title to your campaign. Brief Description: This text appears in the page the supporter will see, and should explain to your supporters what the page is for and why they should take action. The text shows up above the form containing the actual P2P page form information, but below the title. Tax Status: choose the tax status of your organization or the particular campaign here. Select a Template: Choose one of your Web templates from the list. If you don't choose a specific template, your Default Template will be used. to proceed to the next tab. Creation Page Description: This text field lets you describe the campaign or provide instructions for supporters. Suggested Title: This title will appears on every P2P page that your supporters create. Supporters will be able to choose their own title, though you're welcome to enter a suggestion in this field. Suggested Donation Page Content: This content appears on every P2P page that supporters create. Any important info that you want all donors to know should be included here, although supporters will have the ability to edit this. Send These Emails Upon Page Creation: This box lists all auto-responses created in your Salsa headquarters. Choosing one or more auto-responses here will cause those responses to send to the supporter creating the P2P page (i.e. not the donors; we'll configure that later) when the P2P page is created. Click one and drag to select multiple in a row. Hold Ctrl (PC) or Command (Mac) to select individual items. For more information and suggestions about content to include read our related documentation. Add Page Creators to These Groups: Add the supporters who create P2P pages to the group(s) you specify here. You will choose groups to add donors to later on. Click one and drag to select multiple in a row. Hold Ctrl (PC) or Command (Mac) to select individual items. Minimum Donation Goal and Maximum Donation Goal: These are the minimum and maximum amounts an individual can raise to participate in your P2P campaign. It will be handy to suggest goals to them to help them get started, but your supporters will be able to edit these numbers. Note: Please be sure to fill in both a minimum and a maximum, and make sure that the minimum is less than the maximum. Change the Default Redirect Path: choose a landing page for supporters to be directed to after completing their P2P page. This could be your homepage, or another action page, or any location you choose. If not populated, the default redirect will be to a "tell-a-friend" page. Confirm before making public: requires you or one of your organization's Campaign Managers to approve P2P pages before they are publicly available. The search page lets people coming to your website to search for existing fundraising pages. All the P2P pages from the same campaign (i.e. created from the same P2P campaign page) are also listed on the search page. ...where XXXX is your org #, YYYY is your template key, and ZZZZ is the key for the P2P campaign page. Does this make no sense at all? Please contact Salsa Support for assistance! Customize content on the search page:This field will allow you to add content to the search page, such as guidelines for searching or the area in which the fundraising campaign is currently running. In most cases you can just leave this field blank. The content you define in this step will appear in the final donation page--that is, if someone visits your supporter's P2P page and wants to donate, they'll see this information. Most of it is similar to the regular Donation page customization options. Comma delimited amounts: defines the dollar amounts that will be offered on the P2P page. Enter numbers without dollar signs and with commas separating the numbers, like this: 5,10,50,100 As with all Salsa donation pages, there will always be an Other option that allows donors to specify specific dollar amounts if they don't like the pre-chosen ones. Pre Donation Text: this text will appear before the donation options and dollar amounts. Donation page footer: this text will appear before the Submit button. Donation Redirect: You can enter a URL here where your supporters will be taken after completing the page. Merchant Gateway: choose the merchant gateway processor for this page. If you only have one merchant gateway account (as most people do) you'll only see one option here. Do not send automatic notifications to page host: Checking this box will disable the automatic notification the P2P creator would receive when a donation occurs. 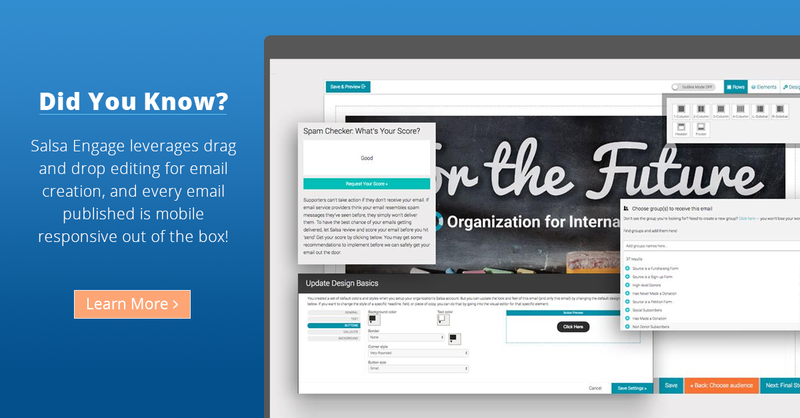 Send donors these email triggers: This box lists all auto-responses created in your Salsa headquarters. Choosing one or more auto-responses here will cause those responses to sendto the donor. Click one and drag to select multiple in a row. Hold Ctrl (PC) or Command (Mac) to select individual items. Add donors to these groups: Add the donors to the group(s) you specify here. Click one and drag to select multiple in a row. Hold Ctrl (PC) or Command (Mac) to select individual items. Request Fields: this section allows you to set the fields that donors will be asked to fill out. As this is a donation page, most default fields will be required. You can add additional standard or custom fields by clicking Add another field. As with the previous page, this tab is very similar to the options page for regular Donations pages. Include Recurring Payments: this option adds recurring payment options to your page. Tell-a-Friend Subject: by default, donors will be directed to a page where they can tell their friends about the P2P page they just used. This field provides the subject for that Tell-a-Friend email. Suggested Tell-A-Friend Message: This text will be supplied as a suggested body for the Tell-a-Friend email. Tell-A-Friend Redirect: A redirect path provided here will be shown to supporters who complete the Tell-a-Friend process. As I understand this, there is no form in which someone who creates a P2P page enters email addresses of those to whom s/he wants to send notice about the page, unlike a Tell-a-Friend page which asks for a list of email address to which a message will be sent. So, does that mean it is up to the page creator to generate their own message and send it to whomever they want to make a donation? Is there a way for a person to add a picture or any other customization to their P2P page? The answer to your question is - use the Tell-a-Friend page! If you look at the published Personal Fundraising Page, there is a Tell-a-Friend link. Once users click on that link, they'll be able to configure a message and enter email addresses in order to send out a custom message about the page. Users who are promoting a personal fundraising page don't have access to your supporter database, so they'll have to send this message to people in their own contact list. If you enable the profile manager, users can log in and edit their page. From that logged-in state, they are able to upload an image. They can also configure the page title, description, and their donation goal. Here's an example of a page where I was able to log in as an end user and add an image to my "demo" donation page. NOTE: We keep that behind a login so you have a little more control over who is uploading (possibly unpleasant) images onto pages with your branding. You can also try team fundraising pages through Givezooks! Is there a merge field that captures the url/donation page the page creator created? I would like to send an "email upon page creation" to the page creator a link they could forward their friends. Is the P2P campaign option included in all Salsa packages? I do not see it as an option in my donations package. Megan - There is an additional cost to add the P2P package. I'll update this page with that information - for now, contact your Client Success Manager to discuss options. An explanation about how to add send a link to a supporter who's created a P2P donation page has been added in a separate document for your reference.